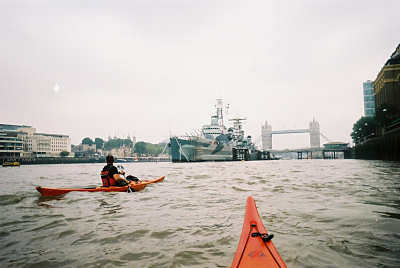 On Saturday 16th September Chris, Dr Dan, Dave W. and Dan J. successfully completed their first kayaking marathon, paddling from Barnes Bridge to Greenwich and back. The trip was hastily arranged following the cancellation of the Lundy trip, but it all worked out really neatly. For a start the tides were perfect; high water at Barnes Bridge was at just after 9.30am and low water at Greenwich at about 3pm. Secondly the trip coincided with the Thames festival. We reached Greenwich seconds before the winner of the Great River Race. The race had some amusing participants, including what looked like a Viking long ship and a pontoon. There were other fascinating boats participating in the Festival, e.g. Thames barges and a very ancient looking steamer. Less happily, we encountered the Thames Bubbler and her sister ship, Thames Vitality, trying to pump sufficient oxygen into the river to revive London's gasping fish after a heavy storm mid-week had washed tonnes of sewage into the river. Fortunately Chris had brought some hand wipes which we used before eating our lunch in Greenwich. We then met up with Hilary and Pete and they kindly treated us to a pint at The Trafalgar to fortify us for the return journey. Inspired by some Morris men at the pub, Chris gave us an excellent demonstration of dancing! Paddling past the major London landmarks like Battersea Power station, the Houses of Parliament, the Tower of London, Canary Wharf and the Millenium Dome was great fun of course, but we also spotted some other unexpected and interesting features of central London, like the slightly weird statues on Vauxhall Bridge. The trickiest part of the trip was avoiding all of the ferries in central London which created quite a bit of wash. At one point Dave and Dan J. ended up cowering by a bridge pillar as a sizeable ferry thundered past only a few feet away. Quite apart from the distance involved (31 miles), this trip requires good boat handling skills. 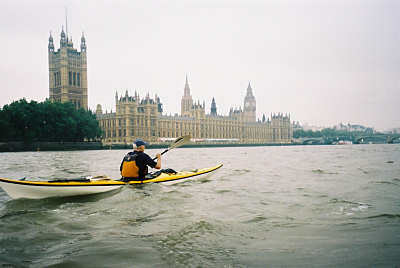 Nevertheless, we wondered whether a London kayak marathon might be a useful addition to future Thames festivals or at least a regular feature on the CSCC calendar. All images ©2006 CSCC. Pictures by Dan J.